The PICkit 3 Programmer-To-Go functionality allows a PIC MCU memory image to be downloaded into the PICkit 3 for programming later into a specific PIC MCU. No software or PC is required to program devices once the PICkit 3 programmer is set up for Programming-To-Go. A USB power source for the PICkit 3 is all that is needed. When using the Programming-To-Go feature, you can only program. No debugging capabilities are available with Programming-To-Go. Enter the name you want to use for your programming image. 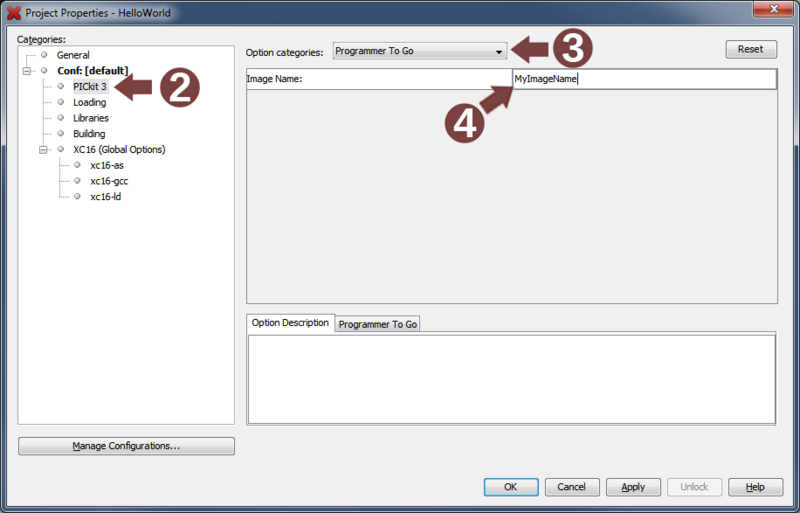 From the main toolbar, click on the downward pointing arrow to the right of the Program Target icon and select Programmer To Go PICkit3 (ProjectName). The PICkit 3 is NOT a production programmer. It should be used for development purposes only. The programmer-To-Go operation offers programming portability for field environments, not for production purposes.